Maria Simón has borne witness to the degradation of the conflict hitting the Central African Republic for over one year. She has been operations coordinator for Médecins Sans Frontières in Kabo (in the north of the country) for the past seven months and she admits it has not been easy. It has been tougher than her previous job in the Democratic Republic of Congo. This speaks for itself. MSF: Tell us about your experience all this time, including different and very marked periods. Maria: Yes, when I arrived in October there had already been attacks from the anti-Balaka militia against the Séléka coalition, then in power. Tension, the uncertainty about what there was to come, was in the air. Everything happening in Bangui echoes across the country. In November, tension between Christians and Muslims rose and in December it finally burst out. The change of government, the anti-Balaka offensive and the withdrawal of the Séléka made many of its members form uncontrolled, very dangerous groups. And, at the same time, we witnessed hundreds and hundreds of trucks full of Muslim people heading for exile towards Chad in search of shelter to save their lives. Terrible. What were they saying? How did they organise the convoys? They travelled in very difficult conditions; they were sitting on top of their belongings at the rear of the trucks, in the sun, sometimes injured, many pregnant women and also children. We have seen women and children with gunshot wounds on their arms and backs. The anti-Balaka’s weapons are not very sophisticated, so in many cases injuries were minor and people could be treated as outpatients. Gunshot injuries, civilians fleeing on a truck. Overwhelming indeed. And what about the Kabo population? They, like the rest of the population in the country, have been crushed - in different periods, whenever there has been political turmoil. They were crushed by the Séléka when they took power. They had to flee and hide in the bush and endure their excesses, their violence. And now, by the anti-Balaka with their violence, their revenge. In Kabo, under Séléka control, the population also suffers from inner tensions caused by the clashes between farmers (most of them Christian) and nomadic pastoralists (Muslim), which is another source of violence to cap it all. This year an agreement has been reached according to which the pastoralists, the Mbarara, will search pastures far from the fields. It is a local agreement, which has not scaled up to other areas and that may generate problems because the Mbarara are armed. We have treated patients injured by arrows from the Mbarara. Last year the conflict prompted population displacements as entire villages set on fire. Herds invade the fields, farmers attack the cows or the Mbarara and the latter take revenge. It is worrying. The population has been fleeing for one year, hiding in the bush as they perceive a minor threat. There have been many such instances this past year, meaning they have to discontinue farming. In Kabo, farmers are able to plant now because they have reached an agreement with the Mbarara, unlike in other locations. If farmers don’t sow, they cannot harvest, malaria will arrive at its peak in a couple of months and fatality may rise when combined with malnutrition. Last year malaria was at its highest. We fear this year it will be even worse. What will be done in this regard? We will try to prevent the infection in a more aggressive manner. Taking treatment to people before malaria hits the hardest. We are going to try even if people are not at home, even if they are hiding in the bush, through mobile clinics. This is a challenge. 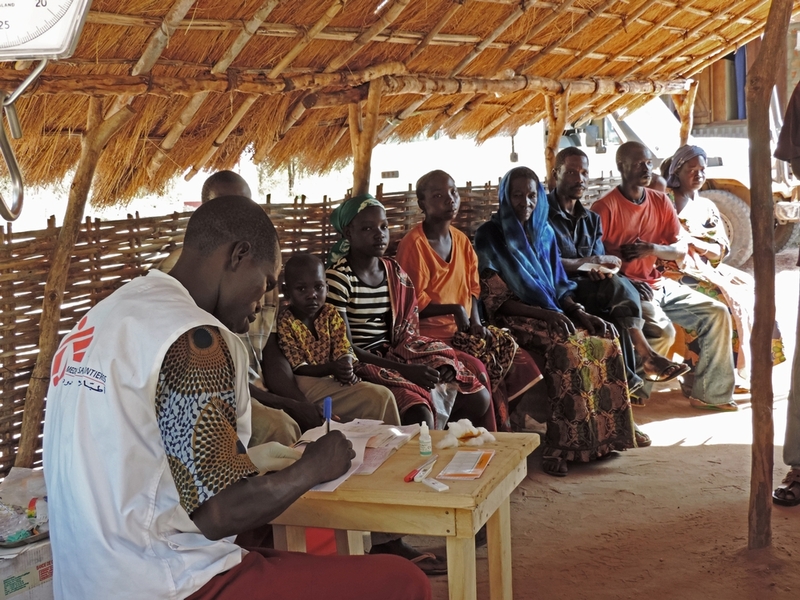 MSF teams from Kabo carry out mobile clinics and support health centres in the periphery. Can you describe the situation right now that you have just arrived back? Shortly before returning, we scaled down activities for one week, protesting against the killing of 16 civilians, including three MSF colleagues at the Boguila hospital, presumably by an uncontrolled Séléka group. Over the weekend the Séléka were organising a congress in Ndele, also in the north, to appoint a new commandant, to rebuild, to regroup. I drove back to Bangui and it is incredible: ghost villages, forsaken. Between Dekoa and Sibut, two locations one hundred kilometres apart from each other, we only saw two men in a village, who most probably had gone to collect some of their belongings they had left behind. As they heard the vehicle engine, they ran to hide. This means that many people are hiding in the bush, people that are living without anything, unprotected and helpless. What has shaken you the most? Due to the geographical situation of Kabo, we have witnessed the flight of Muslim people. I recall a young woman coming from Bouca, 150 kilometres away. The anti-Balaka had set the neighbourhood on fire. The woman told us that three of her children, not older than ten, had burned to death inside their house. She was explaining this resigned to the fact, full of sadness and sorrow....In Bouca there are no longer Muslims left and before they were a vibrant community. In Kabo and Batangafo there are few traders left. They left Batangafo between December and January and those still remaining sent their families far away. From December to February, trucks full of Muslim people have been an ongoing feature, all the day long, even causing traffic jams in Kabo, a town of 15,000 people. In your opinion, what will happen in the coming months? It does not seem that the situation is going to improve in the short run. Of course, the population is still unprotected, it is not enough with the presence of French troops and the MISCA international forces, and the transition government does not have any capacity whatsoever. In Bangui the situation appears to be “normal”, but in the neighbourhoods violence is pervasive. The rebuilding of the Séléka and their condemning of the atrocities perpetrated by some of their most autonomous groups may bring an uncertain calm. Let’s see whether they seek to regain control over lost territory, and head south. The situation is tremendously complicated and the population has been and still is subject to abuse and atrocities from all the parties involved.